This section contains examples of how you would use a HOLD file. Note: Across fields are not allowed in HOLD files. This procedure describes how to extract fields into a HOLD file and then create multiple components in a document from the HOLD file. Add fields that need to be extracted for use in subsequent requests. On the Home tab, in the Format group, click File. In the Temporary dialog box, name the file, choose the format of the Hold file from the format drop-down list, and click Save. Note: The default is to create a temporary Hold file, which is deleted after the report or chart is run. Alternatively, you can create a permanent Hold file by selecting an application path folder location. This file will remain in this location after the procedure is run for future use. On the Insert tab, in the Reports group, click Chart. Add fields to the chart. Add fields to that chart. On the Format tab, in the Chart Types group, click Pie. 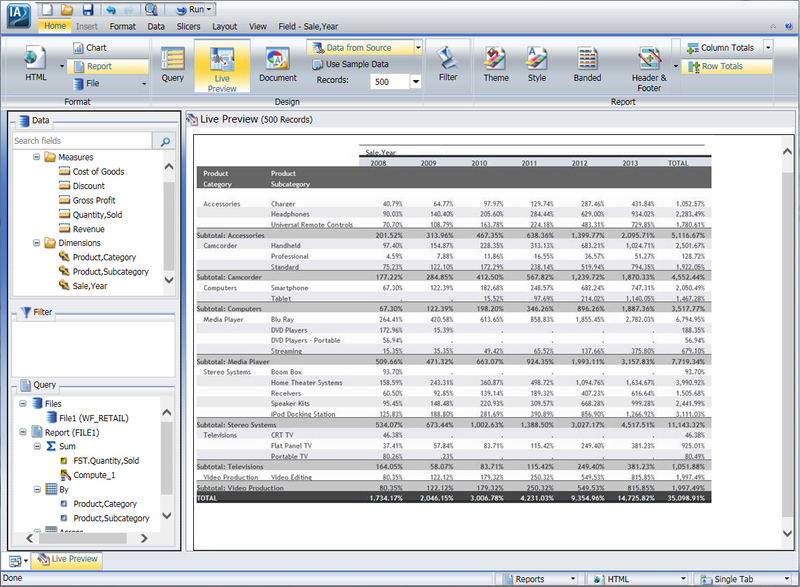 Add as many reports and charts as you want to complete your document. To create a tabular report from a HOLD file, begin by creating a report. In the Open dialog box, select the WF_RETAIL Master File. The Temporary dialog box opens. In the Temporary dialog box, name the HOLD file, keep the default file type, Binary (*.ftm), and click Save. At the bottom of the canvas, click Create Report. The custom database structure displays in the Resources panel. The canvas is returned to a default blank state, enabling the development of a new report using the HOLD file. From the HOLD file, drag Quantity,Sold to the canvas. On the canvas, select the Quantity,Sold column heading. On the Field tab, in the Display group, click Aggregation and then click First Value. Note: The heading changes to FST Quantity Sold. Select the FST Quantity Sold heading. On the Field tab, in the Display group, click Hide Field to hide Quantity,Sold, as it will be used in a subsequent calculation. In the Format field, type D8.2%. 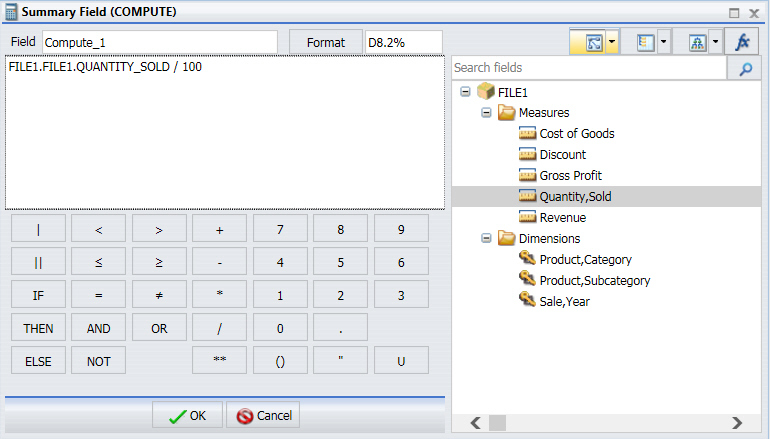 Double-click the Quantity,Sold field to add it to the formula box. Add / 100 after the Quantity Sold field to calculate the percentage. The following image is an example of the Summary Field (COMPUTE) dialog. Drag Product,Category to the By Query field container. In the Query pane, select the Product,Category field. On the Field tab, in the Break group, select Subtotal to create Subtotals on Product,Category. Drag Product, Subcategory to the By Query field container. The final report displays, as shown in the following image. The following procedure describes how to create a HOLD file for use in a subquery. Create a new report with at least one filter condition set. For example, the report shown in the following image lists Customer IDs with Gender equal to Female. The File button is found on the Home tab, in the Format group, and on the Format tab, in the Destination group. The File button is a split button. Click the left side of the button to launch the Temporary dialog box. The down arrow on the right side also opens the Save dialog box so you can change settings or set them for the first time. An example of the File button and the associated ToolTip are shown in the following image. The Select a location and format dialog box opens, as shown in the following image. In the File name text box, type a file name. The default file name is File1. From the list menu, select SQL Script (*.sql) as the file format. Select a location for the HOLD file. The location is either Temporary, which is the default, or a writable server application folder. Note: If the HOLD file name already exists in the specified location, it will be overwritten without warning, when you click Save. The Create Report button appears on the bottom of the InfoAssist Live Preview application window, as shown in the following image. Repeat steps 2 - 4 to create as many HOLD files as you need. To use the HOLD file right away, select the corresponding option, as shown in the following image. 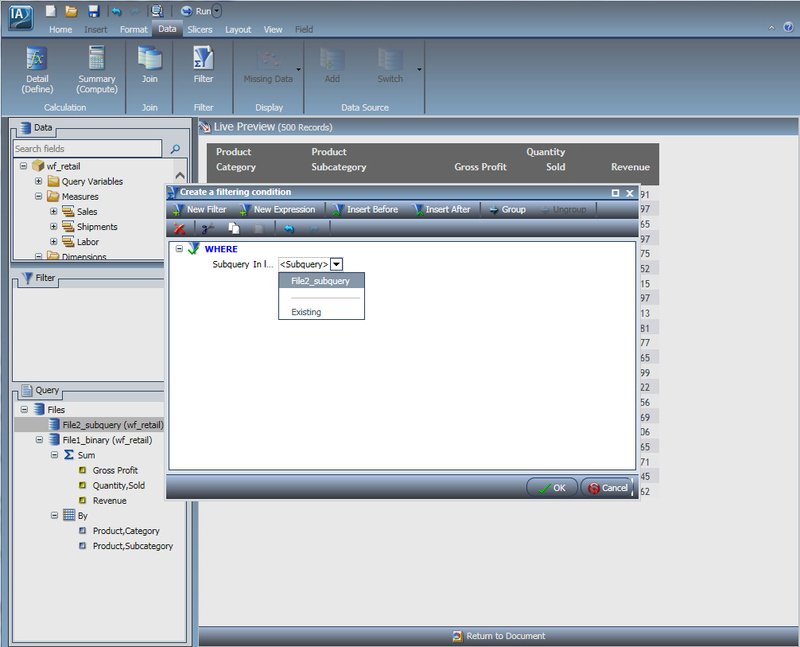 The following image is an example of the Live Preview application window when Create Report is selected. Note: When you are working with a report created from a HOLD file, if you try to switch data sources, or add data sources to the report, you are presented with warning messages. The following procedure describes how to rearrange file components in a HOLD file. Note: This procedure creates a binary HOLD file and a subquery to illustrate how to rearrange HOLD files. It also shows the result of this rearrangement. Create a new document in InfoAssist, using the wf_retail Master File for the data source. The report is shown in the following image. On the Home tab, in the Format group, click File to create a HOLD file. In the Temporary dialog box, enter a name for the file. For example, File1_binary, as shown in the following image. 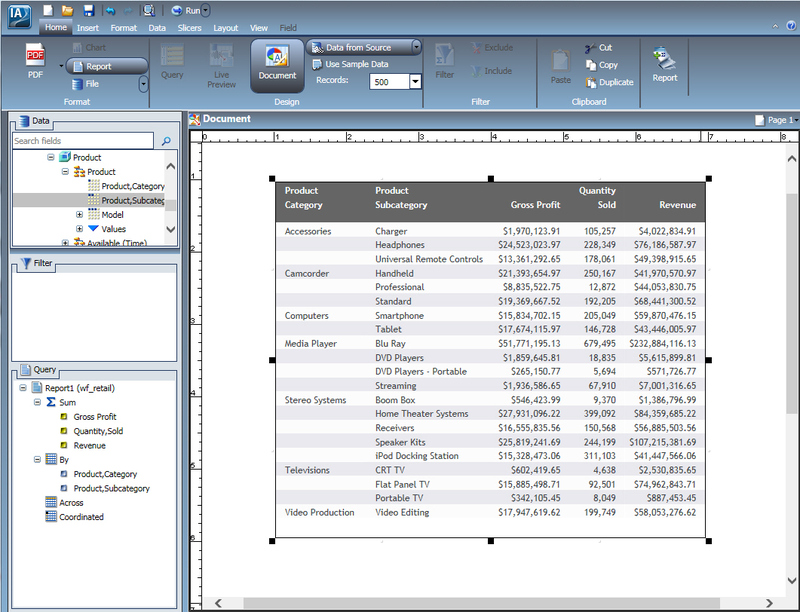 Create a report using the HOLD file, specifying Product,Category, Product,Subcategory, and Quantity,Sold, as shown in the following image. Next, using the following steps, add a subquery SQL script for use as a filter on the first report. On the Data tab, in the Data Source group, click Switch. Select the original master file (wf_retail.mas). Locate and double-click the Product,Category dimension field. 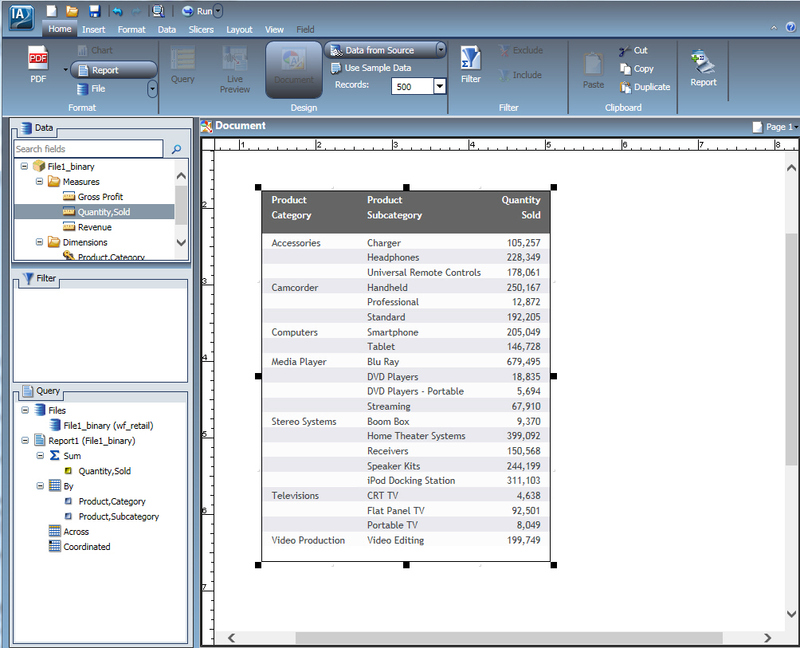 This creates a second report, which you can drag and resize as needed on the Document canvas. 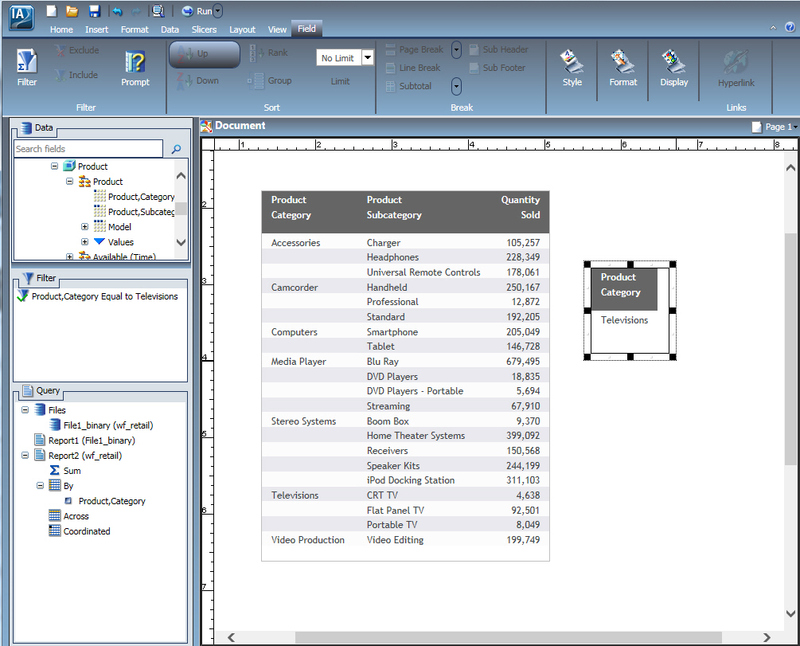 Create a filter on Product,Category, where the product category is equal to Televisions, as shown in the following image. With the new component selected, click the Home tab and in the Format group, click File. In the File name field, enter File2_subquery and select the SQL Script (*.sql) format from the file types menu. Right-click Files in the Query pane and click Arrange Files, as shown in the following image. The Arrange Files dialog box opens. 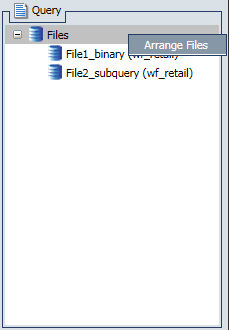 Using the Arrange Files dialog box that displays, select File2_subquery (wf_retail) and click Move Up to move the file above File1_binary (wf_retail), as shown in the following image. 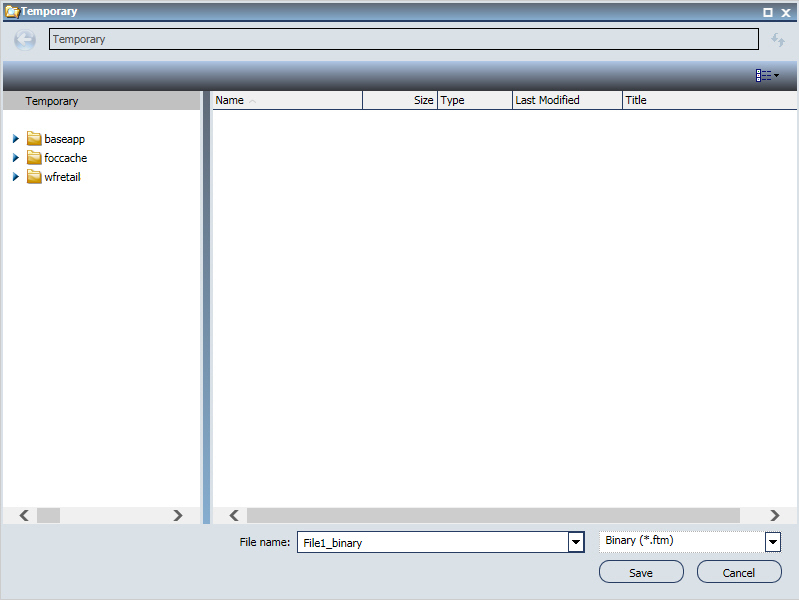 Edit the first report and create a filter using the subquery, as shown in the following image. Click OK to exit the Create a filtering condition dialog box. Your report is refreshed to reflect the filtering you have applied, as shown in the following image. FOCUS is the only format that supports an index field. The maximum number of fields to index is four. If the file format is FOCUS, then Index appears on the Query pane, as shown in the following image.